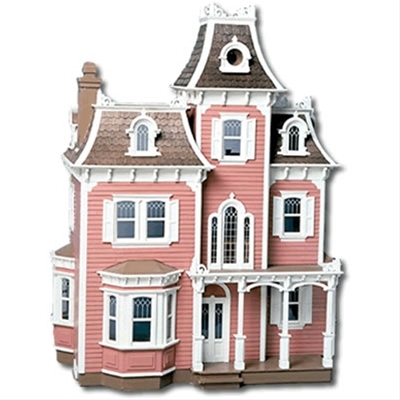 The unique "layer cake" style construction of the Batrie dollhouses gives these houses extraordinary interior finishing capabilities. 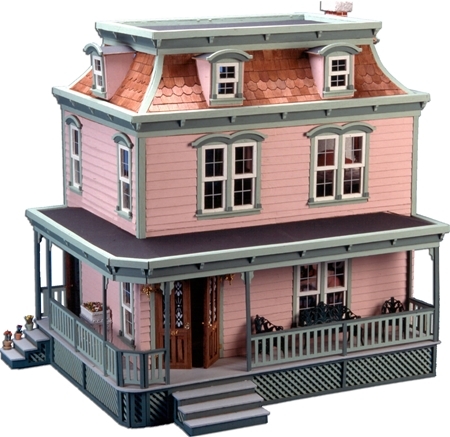 Batrie dollhouses are assembled floor by floor and the horizontal nosing between the floors and vertical connectors gives them attractive exterior detail. Brownstone homes were built in the 1860's. Lots of charm and fun to decorate. The bay front can be assembled with the bay set up or down and either left or right...you get to choose! The Cape Cod style (c.1675 - 1950) reflects the difficult weather and thrifty builders of the early north-eastern coastal villages. A traditional Cape Cod has a steep roof with small eaves to protect the house from heavy New England snowfalls and a large central fireplace to keep it cozy. The 1 1/2-story houses have living space in the attic. 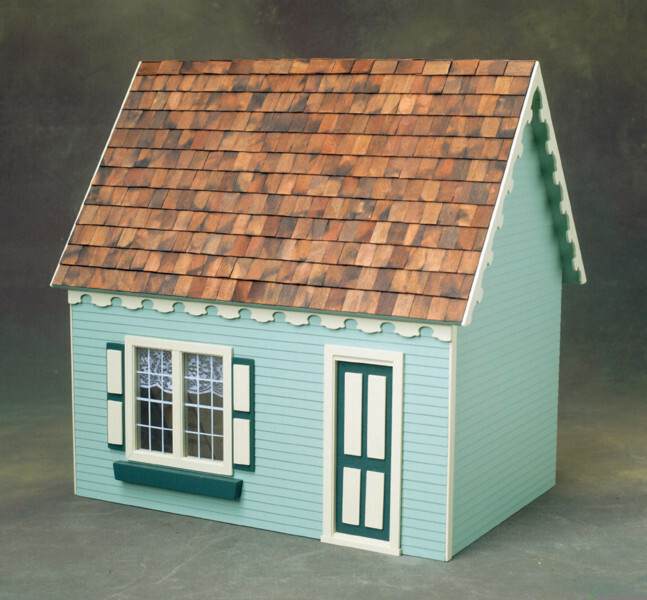 A Cape Cod has double hung windows with mullions, shutters and is finished with clapboard or shingles on the outside. The Colonial house (c.1700 - present) is an American adaptation of the English "Cotswold" or Free holder's cottage. In its earlier version, the Cotswold had an open fire pit inside the house and the smoke would find its own way out through the thatched roof. The fire room was on one end of the house so the residents could keep warm in the loft but still be away from the smoke. This 1/3 and 2/3 division of the house was still reflected in early colonial layouts showing up as offset front doors and non-symmetrical first floor layouts. 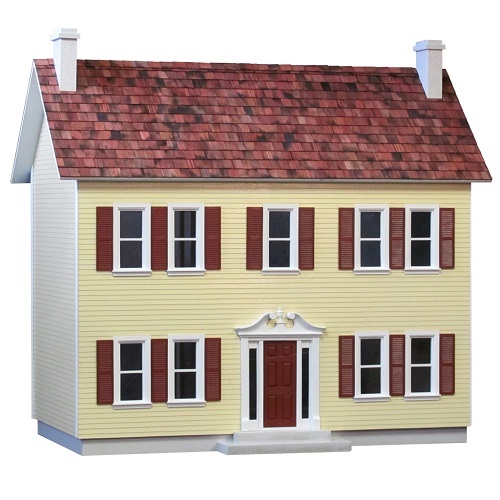 As the Colonial design spread out from the earliest American villages, the typical features were of a house 1-1/2 or 2-storys tall with approximately a 45 degree roof pitch, narrow eaves (for shedding snow) and a narrow front-to-back so every room could be well lighted by the windows. The windows were small pane double hung with no frivolous ornamentation and had shutters. The doors were also plain and utilitarian. The walls were almost always clapboard or wooden shingles. 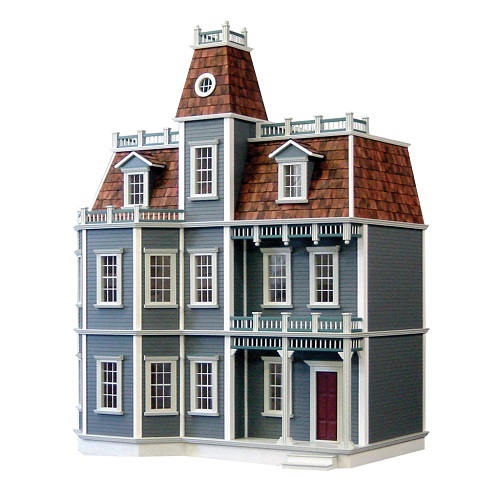 The Colonial design took on the attributes of other styles that were popular at the time of its building, showing Federal, Greek Revival or Victorian details in their turn. Mansard roofs (c.1550 - 1870) are steeply sloping roofs with a flat or nearly flat top. These became very popular in the 17th century of Paris as they took advantage of the property tax laws, which did not tax attic spaces. 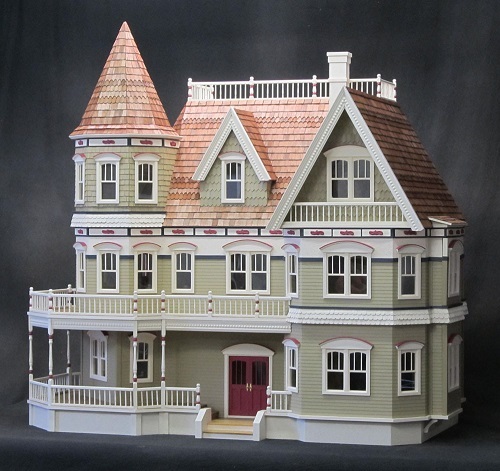 The attic of a Mansard house had a fully usable attic and was tax-free! Architect Francois Mansard took advantage of that in his designs. The word "Mansard" comes from his name being on so many designs for houses with this roof design. The Plantation (c.1803 - 1862) houses reflect the elegance and grandeur of the American south in the early 1800's. 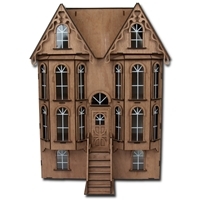 These houses have tall ceilings and a formal layout inside, often with fancy stairways. On the outside, columned verandas with balconies are the dominant feature to shade the interior and catch the breezes. It is the large balcony that differentiates this style from the Greek revival. The Tudor reflects the early English great houses that were made by joining together a frame of hewn timbers, then pounding sticks to jam in between the beams. Finally, two plasterers would stand, one inside and one outside the wall, and press plaster into the sticks until the plaster squeezed through the holes between the sticks and joined the plaster being pressed intothe wall from the other side. More layers of plaster left a masonry wall held in place by jammed lath with the hewn beams showing inside and out. The diagonal beams are diagonal bracing of the frame. Half timbered Tudor houses, ones that step out half way up the wall (so that the second floor is bigger than the first floor) became necessary when the wood supply could not keep up with demand and trees large enough to get timbers that would reach all the way to the top of the wall got scarce. Half timbering allowed the frame to be made from smaller trees. Tudor houses traditionally had the steep pitch and shed dormers of thatched roofs but neo-Tudor houses of the 1890 - 1920's had multiple intersecting gables and peak roof dormers because better roofing materials didn't automatically mean a leak for every roof valley. Tudor windows were arranged in long rows, often with a row of stained glass transom windows right above. Eave trim often-used scroll cut verge board. Balconies or enclosed screened rooms within the framing of the house are common, although porches (which attach to the outside of the house) are less so. A terrace is a more likely ground floor extension of the living space. Victorian architecture (c.1830 - 1900) replaced the Greek and Georgian styles, rebelling against the classical symmetry and orderliness. 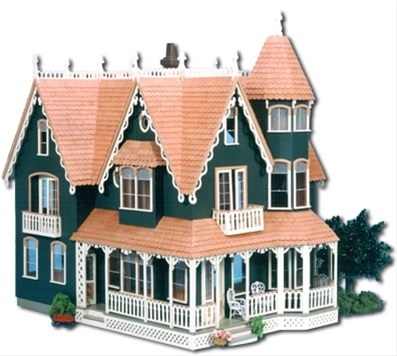 The Victorian style is flamboyant and exciting with tall, steep pitched roofs; multiple gables and gingerbread stick trim or decorated verge boards accenting the eaves. Roofs are further emphasized with layered chimneys and finials or peak cresting. Windows are varied in size and shape and may project from the house in a bay oriel. The outside finish of a Victorian is multi-textured, multi-hued and uses every material possible including clapboard, stucco, board and baton; often mixing finishes. The Queen Anne (c.1876 - 1915) ranges from the "Painted Lady" row houses of San Francisco to sprawling resort mansions. Queen Anne houses are exuberant and comfortable. Rooflines are steep with multiple and intersecting gables and majestic towers. In every section the windows are different, some narrow, some double but there are always lots of them. Every surface of a Queen Anne house is interesting with many textures, many colors and lots of decorations. Decorations include shaped or patterns of color in the shingles, brackets, dentil, eave moldings, beading under every edge with fans, ornamental plaster, patterned shingles and layers of facia testifying to the builder's own imagination.